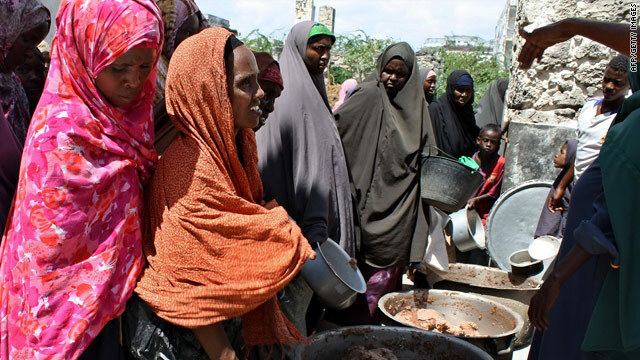 Internally displaced Somali women queue for food aid at a distribution center in Mogadishu. Top U.N. official in Somalia says allegation is "completely misleading"
(CNN) -- The top U.N. humanitarian official in Somalia has fired back at a report that suggests food aid is being skimmed off by contractors as "a cost of doing business" in the war-torn nation, an allegation he calls "completely misleading." "This is far from the case," Mark Bowden, the U.N. resident coordinator for Somalia, wrote in a response to the report. "While U.N. humanitarian organizations recognize that they are working in a complex environment where a war economy has predominated for many years, rather than succumbing with an implied spirit of fatalism to this environment, U.N. agencies and other humanitarian organizations have introduced new measures and approaches to ensure effective management of humanitarian assistance." A March 10 report by the world body's Somalia Monitoring Group found that humanitarian aid was being diverted to military uses in the conflict, and that some Somali contractors hired by aid agencies were channeling profits into armed opposition groups. One part of the report suggested as much as 45 to 50 percent of World Food Programme shipments may have been skimmed off by transport companies, local distributors and the armed groups that control the districts in which they operate. "Under such circumstances the aid community has come to accept a certain level of risk, loss, theft and diversion as 'the cost of doing business' in Somalia," the report states. Bowden's response, addressed to the Security Council and obtained Thursday by CNN, states that World Food Programme officials believe the 45-50 percent figure stems from "hearsay and commonly held perceptions." The report was not "adequately documented," and aid agencies have stepped up efforts to ensure that shipments are reaching impoverished Somalis in recent months, he wrote. "These actions have been undertaken by humanitarian organizations in recognition of the extremely challenging operating environment with which we are continually confronted and in recognition of our responsibilities to effectively assist vulnerable populations in Somalia and our accountability to our donors," Bowden wrote. Somalia has been without an effective central government since 1991. Its U.N.-backed transitional government is under attack by al-Shabaab, an Islamist militia linked to al Qaeda that controls much of the country's south. Fighting between government and rebel troops has escalated a longstanding humanitarian crisis. The WFP says it expects to feed about 2.5 million people in Somalia in 2010. Four WFP staffers have been killed in Somalia in recent years, and the agency suspended operations in the southern part of the country after threats from al-Shabaab. The Rome-based agency has said it has stopped hiring three of the contractors identified in the March 10 report, but has disputed much of its findings and offered to submit to an independent investigation of its operations. WFP spokesman Peter Smerdon told CNN earlier this month that its own probe showed less than 10 percent of food meant for needy Somalis was diverted, most likely by families who received it but sold it for cash. "There are some unsubstantiated declarations in the report, and what we need to do is see what evidence there are behind those, if any, so that we can assess it," Smerdon said. "Without the evidence, it is very hard for us to assess to whether it is true and how to respond." But the U.S. government, which is one of the relief organization's key supporters, reduced its funding in 2009 because of Treasury Department concerns that al-Shabaab benefited from U.N. assistance. "Increasingly, WFP and other organizations are caught in the crossfire between the various warring factions of Somalia," said Peter Kagwanja, president of the Kenya-based Africa Policy Institute. "When you give food to the enemy, then you are always seen as an enemy."